All of our workshops are flexible in both time and content. We can tailor them to fit individual time constraints, or mold them to teach specific lessons. What we teach is largely experiential, and therefore personal to each participant. The development of a new consciousness, like the development of any skill often requires time and practice. Shorter workshops lay out an excellent overall understanding of the subject matter, however longer workshops have a deeper and more lasting effect. In this fun-filled workshop, we learn the basic principles of improvisation as we learn to let go and release our "inner ham". Emphasis is on playing, dropping judgment, agreement, support, listening, and commitment. In the process we learn how improv principles can be used in life to solve problems, keep us more spontaneous, free of judgment and fear, and confident of the genius within. Most of us live in a memory of past moments or in fear or anticipation of future moments. Often we are thinking of anything but our immediate circumstances. Consciously connecting to the Now is a developed skill. Through the experience of improvisational games and exercises, we focus on becoming aware of the elements contained in each moment. Problems are solved more easily as we learn to recognize that guidance and genius are present in every situation, and that by listening to our inner guides and instincts we will gently be shown the most positive way into the next moment. Through improvisational games and exercises, we can experience the freedom of our spirit as it travels through the Four Kingdoms of Consciousness. By learning how to transition from one consciousness to another, we all can learn to make more constructive choices as we move out of the victim mentality into a consciousness of Freedom, Oneness, and Total Possibility. In this workshop you will become one with your expression and soar to new heights of consciousness. All this and laughter too. Jeff and Saba Doucette, founders of LIFE PLAY reveal the dynamic principles of Working Improvisation. 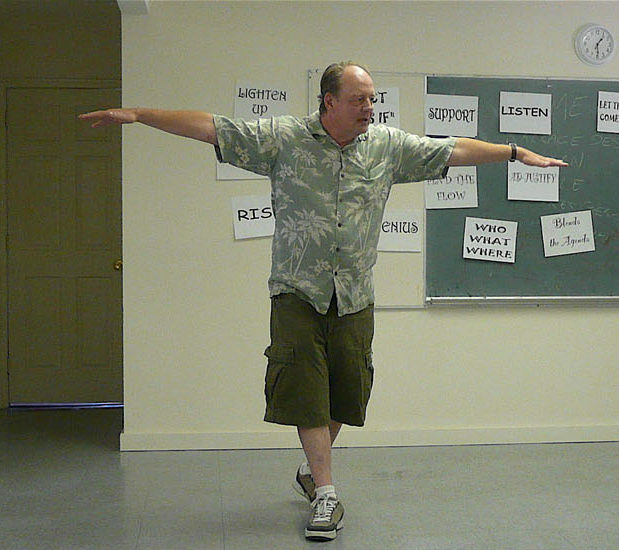 The same techniques used in improvisation that allow improvisers to create dynamic interesting scenes on stage and television can be used to transform your workplace. Working Improvisation is aimed at unlocking personal creativity, successful team building, effective problem solving, increased productivity and focus, and developing strong leaders. Get the most out of your employees and create a harmonious dynamic work atmosphere with Working Improvisation. A dynamic workshop that allows couples the freedom of expression and pure communication. Couples learn to live and communicate in the moment and witness the spirit of love that exists between them. We play games together, discover together, and develop a new awareness together. Jeff and Saba Doucette work with ‘tweens and teens on a regular basis in church groups and workshops. The kids easily bond together in an atmosphere of fun in this workshop that is aimed at building trust as it breaks down barriers and encourages them to think independently. They learn to drop the inner critic that limits their experience of life and each other, and encourages the integration of improv principles into their coping and problem solving skills. Judgments come and go, and those judgments reveal something about you to yourself. In one moment, you see exactly how you have learned how to “play it safe,” and disconnect from your authentic self. Then in the next moment, you have the opportunity to re-connect to that self, and experience the thrill and freedom of vulnerability and non-judgment. And the beauty of it is that everyone is going through the same experience; feeling vulnerable and having fun all at the same time. We experience the unity of life and purpose. There is no threat despite what our egos would have us believe. We discover freedom in surrendering to the moment and gliding along in the Now. We realize that we can handle anything in the moment, and that the only thing that has ever stopped us is our own warped sense of limitation. Everyone is rooting for everyone else to succeed. There is no enemy here, no threat to hide from except those that are self imposed. We are all on the same level. We are all exposed and loving it. What improv teaches is that life is a creative act, and every moment is filled with choice and opportunity. It teaches that you will be ok even if you’ve never experienced this moment before. You start to identify “the flow” and jump into it with both feet. You support the expression of life in others as you experience that same support for yourself. Ultimately you learn that safety lies in being totally present in each moment, and that the ego’s version of safety is limited and cynical. You see that the world is a creative medium, and you were meant to create. You become an artist, and use every moment as a brush stroke of your choosing.